Despite our best efforts to explain the two oaths a new justice must take and the traditions surrounding the administration of the oaths, there evidently is still some confusion going around. When I arrive at the White House press room this morning in advance of Neil Gorsuch’s Rose Garden ceremony, I overhear a correspondent talking on the phone to his editor about the “ceremonial re-enactment” of the oath about to take place. When he hangs up, I gently offer a clarification: Gorsuch took his constitutional oath, which was administered by Chief Justice John Roberts Jr. in the justices’ conference room at the Supreme Court, at 9 this morning. And at 11 a.m., here at the White House, Justice Anthony Kennedy will administer the judicial oath to Gorsuch, which is just as necessary to become a full-fledged justice. Or so we think. There will be bit more confusion a little later on in the Rose Garden, where the sun is shining and the temperature is in the 70s. It is reminiscent of March 16, 2016, when President Barack Obama announced Chief Judge Merrick Garland as his nominee to succeed the late Justice Antonin Scalia. At the back of the garden today, a U.S. Marine Corps string ensemble is providing an elegant soundtrack to the event. The audience is filled with many of the Gorsuch supporters who were in the East Room of the White House on Jan. 30 when President Donald Trump announced Gorsuch as his nominee. Several of those were also a frequent presence at Gorsuch’s confirmation hearing. Some special guests will be singled out by Trump or Gorsuch, but among the other notables is Leonard Leo, who is on leave from the Federalist Society to work on the Gorsuch nomination and is the subject of a Jeffrey Toobin profile this week in The New Yorker. Leo is in the third row, seated behind the spouses of the justices. Attorney General Jeff Sessions is here, near the front. A bit farther back in the crowd is Rachel Brand, a former Kennedy law clerk whose nomination to be associate attorney general has been forwarded to the full Senate. Greg Garre, a solicitor general under President George W. Bush is here, as is C. Boyden Gray, a former White House counsel under President George H. W. Bush. A bit farther back, in the last row of guests before the two rows of seats set aside for the press, are two prominent progressive-leaning lawyers who backed Gorsuch’s nomination. David Frederick, a Supreme Court litigator who wrote an op-ed in The Washington Post in March supporting the nomination (as virtually every Republican member of the Senate Judiciary Committee pointed out during the hearing), is here. And in the same row is Neal Katyal, the former acting solicitor general under Obama who wrote an op-ed in support of Gorsuch in The New York Times and testified on the opening day of the hearing. Just before the ceremony begins, the seven members of the court (except for Kennedy, who will enter with Trump and Gorsuch) arrive and take seats in the front row. They evidently do not agree with retired Justice John Paul Stevens, who did not think it appropriate for sitting justices to attend White House swearing-in ceremonies, though he relented when he was called upon to swear in Roberts as chief justice in 2005. Already seated near the justices’ spouses are the court’s chief officers: Marshal Pam Talkin, Clerk Scott Harris, and Jeffrey Minear, the counselor to the chief justice. 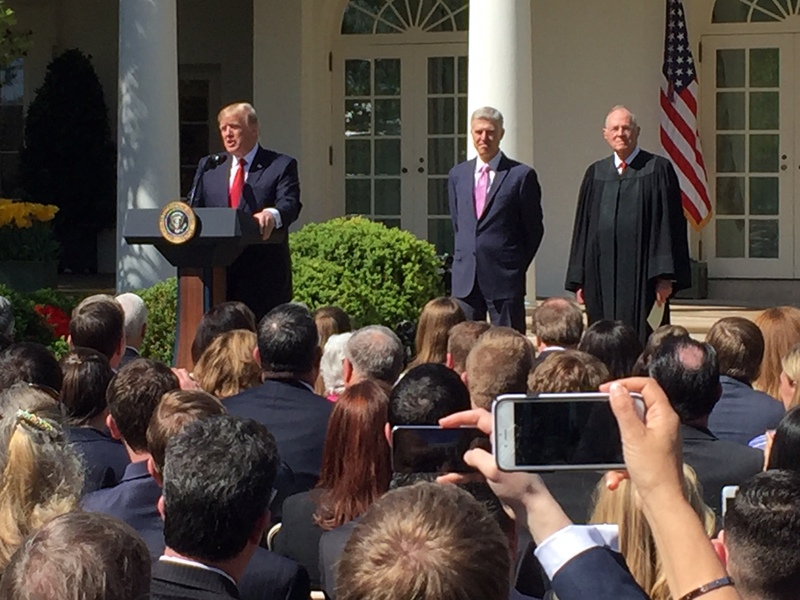 A voice over the loudspeaker announces Trump, Kennedy and “Justice Gorsuch.” Is Gorsuch a justice by virtue of having taken just the first of his two oaths? Trump welcomes the justices. He welcomes Senators Cory Gardner of Colorado, who helped introduce Gorsuch at his confirmation hearing; Mike Lee of Utah; and Mike Crapo of Idaho. All are Republican, and the latter two serve on the Judiciary Committee. The president also welcomes Judiciary Committee Chairman Charles Grassley (R-Iowa). Trump asks Maureen Scalia, Scalia’s widow, to stand, while he pays testament to her and to Scalia. She is seated in the front row, between Justice Elena Kagan and Scalia’s son Eugene. Trump heaps praise on Kennedy, and says “it is a very special moment” for Kennedy to swear in Gorsuch and for the first time have a justice serve with one of his former law clerks. With an invitation from Trump to say a few words, Kennedy thanks the president and says, “Mr. Chief Justice, Justice Gorsuch, and my fellow adherents to the idea and the reality of the rule of law,” before explaining the origin of the constitutional and judicial oaths. 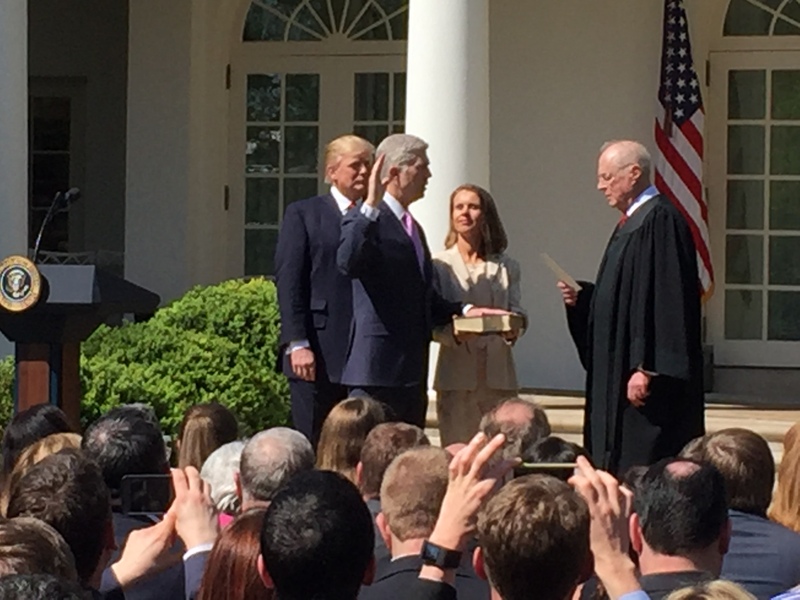 “And so, Justice Gorsuch, there is one oath remaining for you to take, the judicial oath, before you may receive and accept your commission” from the president, Kennedy says. He thanks Kelly Ayotte, the former U.S. senator from New Hampshire who was his chief “sherpa” during the confirmation process. He thanks his former law clerks, his now-former colleagues on the U.S. Court of Appeals for the 10th Circuit, and his new colleagues on the Supreme Court. He has so many thank yous, his remarks are starting to sound like an Oscars speech. But we don’t think the Marine ensemble will play him off the stage. He thanks his wife, who is now standing behind him next to the president, and his daughters, “Emma and Bindi” (Belinda), who are making their first public appearance related to the confirmation. With that, Gorsuch has a handshake for the president, a hug for Kennedy and a shoulder rub for his wife. The Associated Press will soon transmit photos with captions that refer to the ceremony as a “re-enactment” of his first oath. The only real re-enactment will come sometime soon when the Supreme Court holds an investiture ceremony in the courtroom, during which Gorsuch will repeat the judicial oath. But we can now refer to him, without any doubt, as Justice Gorsuch.